While I hadn't watched this show when I was a preteen, Kevin sure did. The Wild Thornberrys was a very popular show for a lot people in my generation growing up. So when I was asked to review the The Wild Thornberrys: The Complete Series, I knew it would be something the boys would enjoy watching with Daddy and even myself! The Wild Thornberrys: The Complete Series was released to DVD exclusively at Walmart, October 20th, 2015, by Shout Factory Kids, in collaboration with Nickelodeon! My daughter who is now 16 was quick to point out how she used to watch it a ton as a child and that she knew the boys would watched it and love it! She told me I needed to get it as they would love to have it available always at the house. This DVD set includes 15 DVD's featuring all 91 original episodes of the hit Nickelodeon series. The synopsis says "The hit series The Wild Thornberrys follows the Thornberry family as they travel the world in their Communications Vehicle (or CommVee) looking for rare animals to film. After an encounter with a mysterious shaman, their youngest child Eliza was given the power to speak to animals! Travelling to every corner of the world with her family of daffy documentarians, Eliza uses her fantastic skill to learn about the lifestyles and habitats of the world’s most exotic creatures. Encounter wildlife in all its natural glory and eavesdrop on Eliza’s conversations with silverback gorillas, pythons, crested grebes, tapirs, capybaras, antelopes and more while the CommVee travels on!" I have to say not only is Dane happy to watch this constantly but Declan is totally obsessed with this show. It was filled with tons of action and comedy! Both boys have watched ALL 15 disks quite a few times already and in fact it was our most recent day off video of choice!! 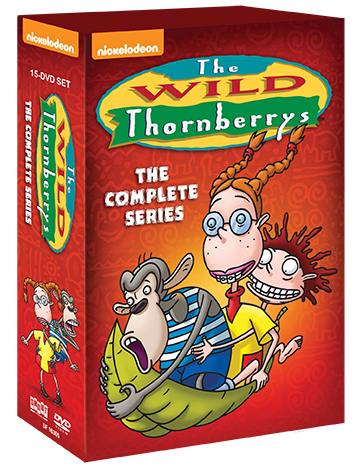 Giveaway: Shout Factory is going to give one of A Lucky Ladybug's lucky readers a The Wild Thornberrys: The Complete Series of their own! I have a lot of them The original Addams Family. Also I Dream of Jeannie, and Bewitched. I loved Scooby Doo! I remember watching this show with my kids :) It is a very cute one. I loved Scooby Doo as a kid. And Speed Buggy. I loved watching The Rug Rats. I was so excited to watch the show with my own son when I found it on Netflix. I wasdisappointed when he took no interest in watching it. I had forgotten about The Wild Thornberrys until I saw this post. I believe he will enjoy the action and humor much more in this show than he did the Rug Rats. I loved watching Bugs Bunny every Saturday morning. I am older than the usual TV shows, but I loved Roy Rogers! I used to love The Love Boat when I was a kid. I loved watching Tale Spin as a child! I watched The Wild Thornberry's too! A show that I loved when I was in high school was actually a soap opera-Dark Shadows! I remember watching Bewitched, Rugrats, and especially The Brady Bunch! Brings back good memories! I loved watching Bugs Bunny and The Roadrunner. A cartoon that I loved watching was Josie and the Pussycats. It was on tv on Saturday mornings. I loved this show as well as Hey Arnold. Oh gosh, I am old, so I really love The Flinstones. We had TV trays and TV dinners too! I remember I loved Rainbow Brite. I remember watching 'Doug', Rugrats, Loony Toons, The Angry Beavers, Fraggle Rock, and The Wild Thornberries, too! I remember watching the Classic Looney Lunes, it the newer version is much different that previous seasons. I liked watching anything Donald Duck when I was younger, I always thought that he was so funny when he would get mad about something. I remember loving Rugrats for years, lol even after I was way too old to be watching it. It's such a classic! I loved watching Bugs Bunny and Tom and Jerry. I thoroughly enjoyed scooby doo and strawberry shortcake. I always liked the Peanuts' specials. I watched a ton of I Love Lucy. I absolutely love Rugrats. I want the whole box set!! You have a list of links to current giveaways on your sidebar. I would update the list so that each one links to its specific giveaway. Right now it's just text. For cartoons I remember loving the Smurfs and I also loved Family Ties and Growing Pains for sitcoms. I loved Rugrats and Rocko's Modern Life! I loved the Flintstones and the Jetsons.